The Amplified Bible, Classic Edition (AMPC) is a distinctive English translation that was made to uncover—in addition to the most precise Greek/Hebrew single word equivalents—the diverse shades of meaning that are a part of words in any language. This allows the reader to become aware of the whole spectrum of what a Hebrew or Greek listener would intuitively know—the whole spectrum of what God wants you to know about Himself. As many—or as few—words as needed are employed to carry a word’s range of original, historical/contextual meaning(s). Footnotes reference the Greek/Hebrew scholars responsible for particular wordings. In and of itself readable and illuminating, the Amplified Bible also works as an exemplary complement to other Bible translations. This version of the Amplified Bible is the 1987 edition. 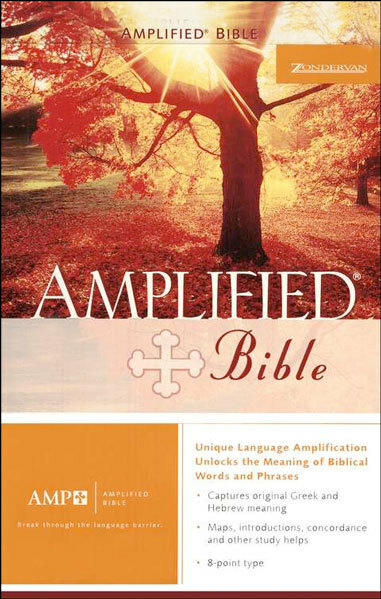 For the 2015 edition of the Amplified Bible, see the Amplified Bible - AMP (2015 Edition).